The MassLib structure module is essential for structure elucidation work. 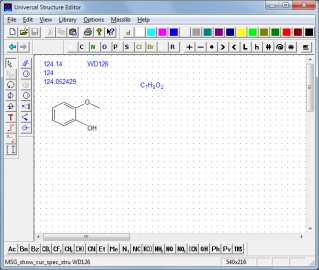 This module allows to draw, save and search chemical structure plots. It also includes the bond separator tools to visualize structure fragment masses in your spectra. The structure module allows you to step from SISCOM’s spectra search hitlist into the structure editor, where you can build up a hypothetical structure for your unknown and then test it via various configurable structure searches. The Universal Structure Editor (USE): A very fast and convenient structure drawing program. USE is called most easily by doubleclicking on the structures displayed in the MassLib main window. The structure editor’s user interface offers both mouse and keyboard operation. Using the keyboard shortcuts enhances more experienced users’ performance significantly. USE imports and exports molfiles, and offers two mass related separator tools (a straight line and a polyline) for visualization of structure fragmentation. From within USE structures (together with fragmentation information) may be copied to spectra and saved into user libraries. Also from within USE structure searches can be started in order to find identical and/or similar structures and their spectra. More information about MassLib can be found at www.masslib.com. The full MassLib product datasheet is available trough the ‘contact us’ link below.